This is the first movement, and the unifying device, of the famous suite for piano Pictures at an Exhibition. It has also become known through various orchestrations and arrangements, with Ravel's arrangement being the most recorded and performed. According to critic Vladimir Stasov, in this piece Mussorgsky depicts himself roving through a picture exhibition, now leisurely, now briskly in order to come close to a picture that had attracted his attention, and at times sadly, thinking of the recently departed painter, who was his friend. 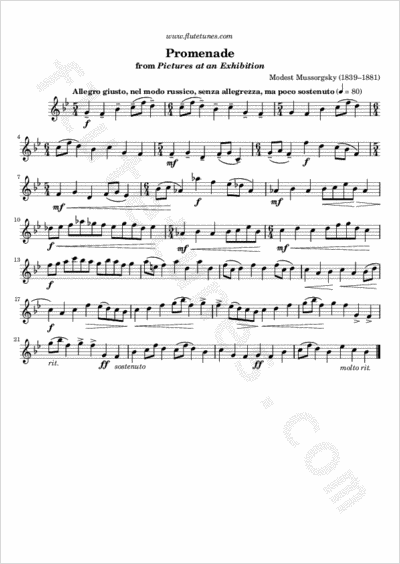 The melody and rhythm resemble Russian folk songs: the piece has simple, strong rhythms in asymmetrical meter. It is to be noted that while the original meter of the movement was a rather uncommon 11/4, published editions usually alternate 5/4 and 6/4.